They imitate fragrances of rose, lemon, mint, pine, nutmeg and other spices. Perfume doesn’t come from flowers but from leaves. Easy to cultivate they chase away mosquitos, also used in cooking. 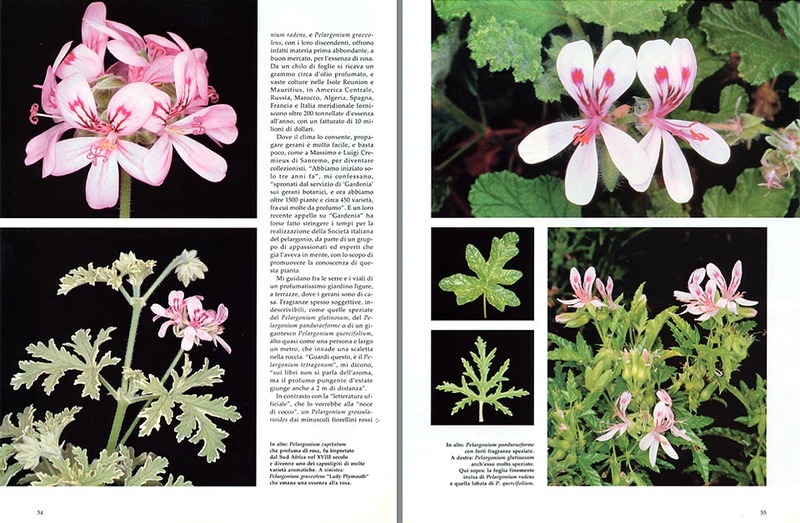 There is no other genus which has so many different perfumes as the Pelargonium. Fragrances of rose, lemon, orange, apple, apricot, strawberry, almond, lemon balm, mint, lavender, pine, citron, nutmeg, coconut, sandal, cinnamon, ginger and thousands of species with indefinable gradations, depending on the variety, the environment, and the cultivation techniques. Aromas which do not come from the flowers, but from the leaves, when just skimmed, and reveal, suddenly, very intense, after a shower, or in the morning, when the dew disappears, and their precious volatile oil sets free in the wind. Maybe it’s a protective shield against the sun, to reduce the transpiration; maybe a mark for the pollinators; or, maybe, a casual by-product of the metabolism. Botanists have freed themselves in fanciful hypotheses about these aromas, but probably, it’s just a means for discouraging the herbivores, in quite dry, often pre-desert lands, where there is not much to eat, and the plants defend themselves either with the “cold steel” (thorns), or with the “chemical war” (alkaloids), from the animals’ voraciousness. Professor J.J.A. Van Der Walt, of the University of Stellenbosch, author of three famous texts about South African geraniums, has no doubts about this. For seducing the pollinators, he explains to me, odd flies with a long trunk, are sufficient the nectar and the converging drawings of the petals. It is not matter, then, of scents to attract insects, but of repellents; in fact these aromas originate, mainly when touched, when the leaves are struck. The Pelargonium capitatum, radens and graveolens, with their descendants, furnish, in fact, abundant, cheap, raw material, for the attar of roses. From a kilo of leaves, they extract about one gram of fragrant oil, and huge cultivations in the islands of Reunion and Mauritius, in Central America, Russia, Morocco, Algeria, Spain, France and southern Italy, do furnish more than 200 Tons of attar per year, with sales totalling the 10 millions of Dollars. 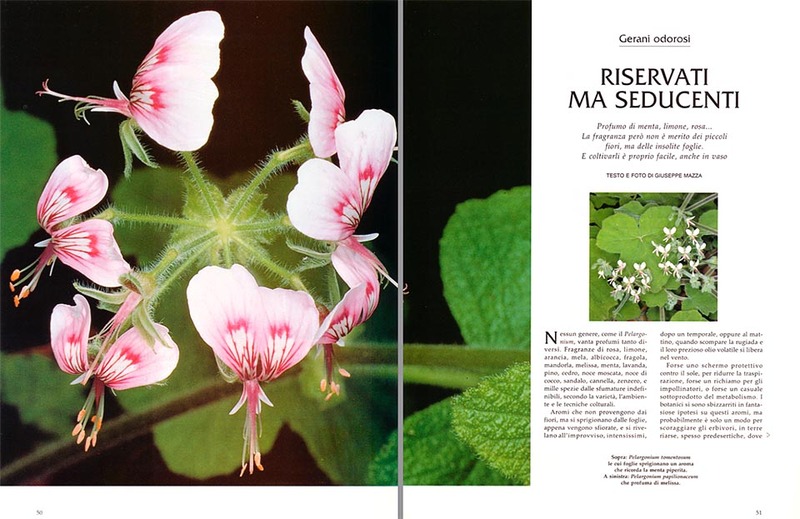 It is easy to propagate geraniums where the climate allows it, and not too much is required to become collectors, as it happened for Masismo and Luigi Cremieux, in San Remo. 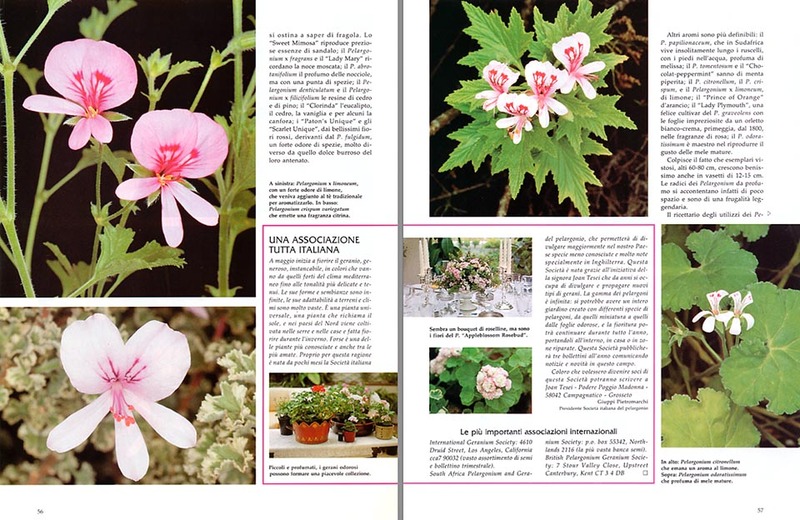 A recent appeal made by them on Gardenia, has led, as in many European countries, to the creation of an Italian Society of the Pelargonium, for the promotion of the knowledge of these plants and the exchange of cuttings and seeds. They take me between the greenhouses and the alleys of a very odorous terraced garden, where the geraniums are of the family. 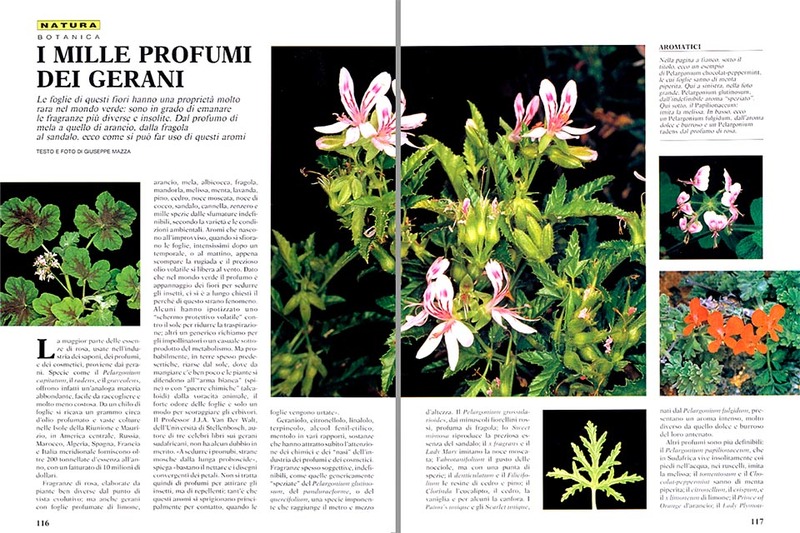 Fragrances often subjective, beyond description, like the spicy ones of the Pelargonium glutinosum, the panduraeforme, or a gigantic quercifolium, almost as tall as a person, and a metre wide, which invade a little stairway in the rock. Look at this! the tetragonum. On the books, they do not talk of the aroma, but its pungent scent of summer, reaches even a distance of two metres. 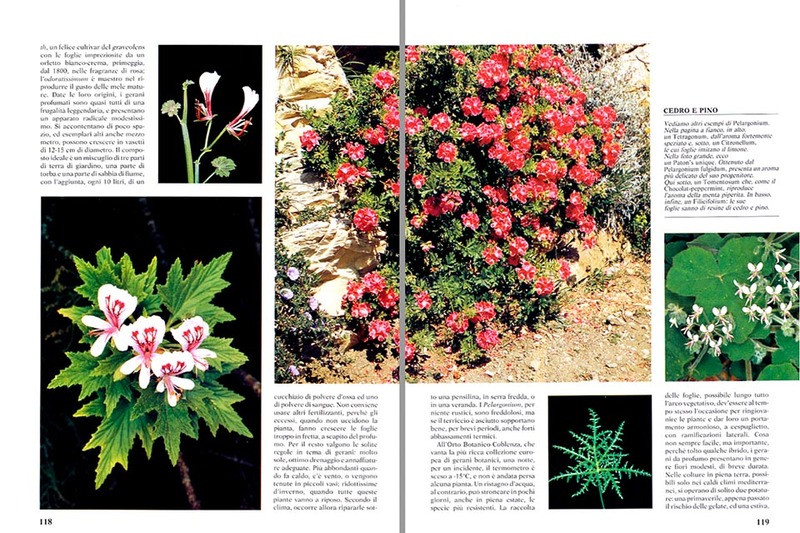 Contrasting the “official literature”, which says it smells of “coconut”, a Pelargonium grossularioides, with its small red flowers, insists in smelling of strawberry. The “Sweet mimosa”, reproduces precious essences of sandal; the x fragrans and the “Lady Mary”, imitate the nutmeg; the abrotanifolium, the taste of the hazelnuts, but with a touch of spices; the denticulatum and the “Filicifolium”, the resins of citron and pine; the “Clorinda”, the eucalyptus, the citron, the vanilla and, for someone, the camphor; the Paton’s unique”, and the “Scarlet unique”, with very nice red flowers, coming from the fulgidum, a strong scent of spices, much different from the one, sweet and buttery, of their ancestor. Other aromas are better definable: the papilionaceum, which, in South Africa, lives, unusually, along the streams, with its feet in the water, imitates the lemon balm; the tomentosum and the “Chocolat-peppermint”, smell of peppermint; the citronellum, the crispum, and the x limoneum, of lemon; the “Prince of Orange”, of orange; the “Lady Plymouth”, a lucky cultivar of the graveolens, with the leaves made precious by a small white-cream border, excels, from 1800, in the fragrances of rose; the odoratissimum, masters the reproduction of the taste of ripe apples. It is striking the fact that showy specimen, tall 60-80 cm, grow up very well in 12-15 cm small pots. 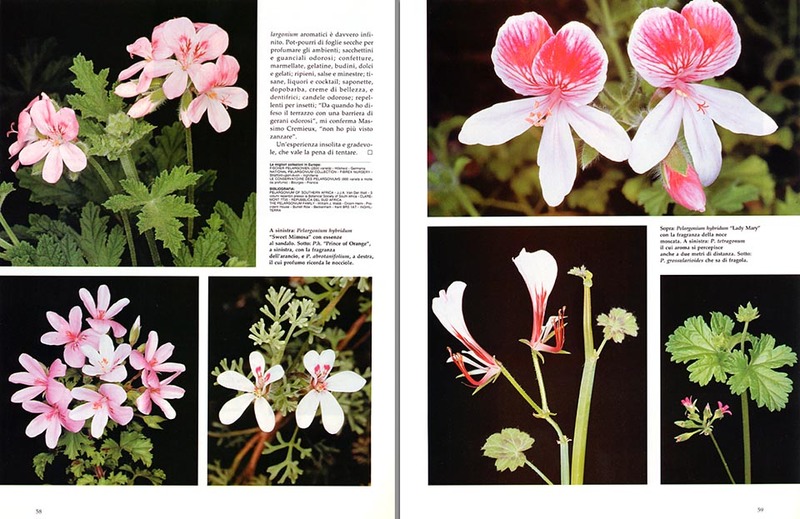 The roots of the fragrant Pelargoniums content themselves in fact of little room, and have a legendary frugality. The best compound, well drained, must not be too rich: three parts of sandy mould, one part of peat, and one part of river sand, with a spoonful of bones powder and one of blood powder, for each 10 litres, will be quite ok. Excesses of chemical and organic fertilizers, risk, in fact, to cause the leaves to grow up too fast, to the detriment of the scent. For the rest, the usual rules concerning the geraniums, are in force: lot of sun, very good drainage, and adequate watering. More copious when it’s warm, or windy, and the plants are cultivated in small pots; very reduced in winter, when they rest. Depending on the climate, it will be then necessary, to shelter them under a roof, in a cold greenhouse, or a veranda. The Pelargoniums feel the cold very much, and are not at all rustic, but, if the soil is dry, they tolerate well, for short periods, even strong thermic lowering. In the Botanical Orchard of Koblenz, which gives hospitality to the richest European collection of botanical geraniums, during a night, due to an accident, the thermometer went down to -15 °C, and not even a single plant has been lost. A stagnation of water, on the contrary, can kill, in a few days, even in summer, the most resistant species. The harvesting of the leaves, possible during the whole vegetative time, must be also the occasion for rejuvenating the plants and for giving them an harmonious appearance, bushy, with many lateral branches. Difficult thing with untidy and prostrate species like the tomentosum; but important for aesthetic purposes; so much that, excepting for some hybrids, in bud all the year round, the fragrant geraniums usually exhibit flowers very modest and of short duration. In the cultivations in open land, usually two pruning are done: one in spring, as soon as the risk of frosts has passed, and one in summer, which allows to get, in the same time, some vigorous cuttings. In our climates, the best period for these ones goes from May to August. In fact, it is important that the young plants develop well the roots, and start again with some leaves before the rigours of winter. We have to choose some 7-10 cm branches, with at least three nodes, cutting, as always, just under the last node. All the basal leaves, must be then placed, in the shade, in a compound of sand (75%), and peat. Watered every day, without excesses, they take root, usually, without any problem, in 2-6 weeks. Another method consists in placing the cuttings in water (to be renewed every now and then), in small pots close to a window. And as soon as the roots get close to the centimetre (later, they would break), are to be planted directly in the final compound. The reproduction from the seeds, is easier and quicker of what we think. Watered repeatedly, in order to take off the germinative inhibitors, these open in 4-10 days in a compound of 1/3 of peat, 1/3 of thin perlite and 1/3 of sand. After one month, the positioning in small 8 cm pots. 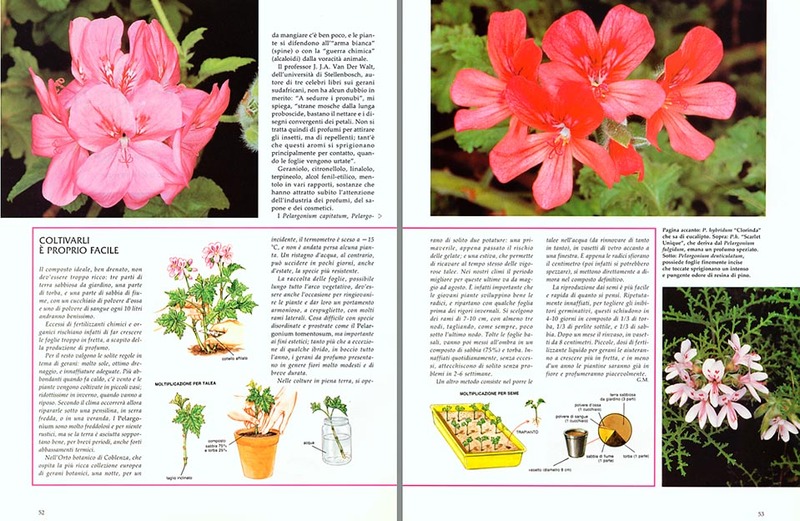 Small, exceptional amounts of liquid fertilizer for geraniums, will help them to grow faster, and, in less of one year, the small plants will be already blooming. 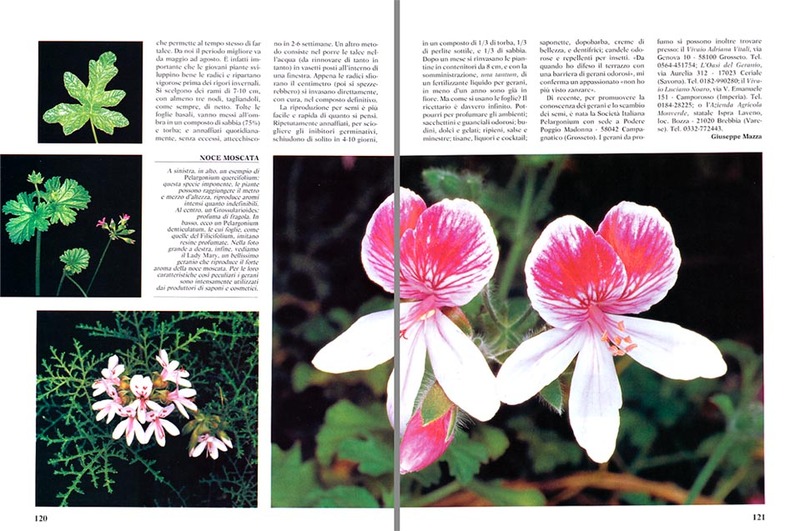 The recipe book of the utilization of the aromatic Pelargoniums is really endless. Pot pourri of dry leaves to perfume the rooms; fragrant small sacks and pillows; jams, marmalades, jellies, puddings, sweets and ice-creams; stuffing, sauces and soups; infusions, liquors and cocktails; cakes of soap, aftershave, beauty creams and toothpastes; odorous candles; repellents for insects. “Since when I have defended the terrace with a barrier of aromatic geraniums”, Massimo Cremieux confirms to me, “I have not seen mosquitoes any more”. An unusual and pleasant experience which is worthy to try.